They’re long and complicated and full of numbers: for people who don’t already know a lot about nutrition, those black-and-white boxes can seem impossibly intimidating. But here’s the good news: once you know what to look for, you can skim just a few lines to find the most important information. The key is knowing how to read the darn things. Whatever your eye is naturally drawn to on a food package, skip reading that part. That’s the advertising, which is the worst possible source of factual and useful information about the food. Instead, look for that black-and-white box on the side. Sure, it looks like something excerpted straight from the SAT, and your eyes might glaze over if you try to read it straight through, but that’s where the gold mine is. Really. The ingredients list is usually at the bottom of the Nutrition Facts label. Go here first! As a rule of thumb, it should be short, and most of the items listed should be familiar to you as food. For example, on the left in the picture below is the ingredients list from a bottle of apple cider vinegar. It contains two ingredients, and one of them is water. The other ingredient is vinegar, which most of us recognize as food. On the right is a list of ingredients from a package of Keebler ice cream cones (just as a representative example of a food that does nothing for your health). It’s…bad. 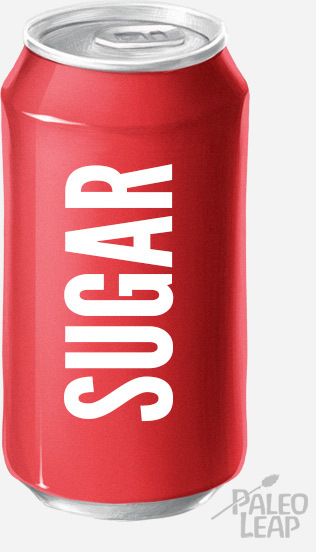 Sugar, by all of its names: everyone knows sugar is bad for you at this point, so the marketing folks at big food companies use all kinds of names to hide it. “Cane juice,” “corn sweetener,” “beet juice,” etc. – all sugar! Honey, maple syrup, and molasses are all basically sugar, “natural” or not. Here’s a comprehensive list of 61 different names for sugar. Corn: sometimes also called maize. 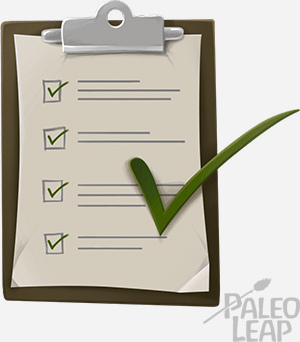 Corn syrup, corn flour, corn oil – none of it is Paleo. Junk oils: peanut oil, “vegetable oil,” and all their industrially processed friends. If you keep an eye out for those things, you’ll catch most of the potentially hidden non-Paleo ingredients. Sometimes, you’ll see different ingredients in bold, and/or a bolded statement at the bottom that the food “contains wheat, milk, soy, and egg ingredients” (or a similar list). This is an allergen warning but can be helpful for spotting non-Paleo ingredients. Tip: bear in mind that some ingredients with scary-sounding names may actually be perfectly harmless. Don’t automatically reject something because of one or two ingredients you don’t recognize. After a closer look at the ingredients, skim the nutrition facts, but only look at the important parts. Nutrition label requirements in the US have recently changed, and companies are in the process of switching over from old to new. In the meantime, you’ll probably see both types. They aren’t very different. 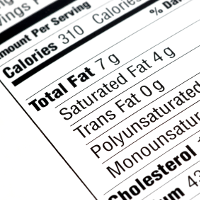 Fat: make sure the food has 0 grams of trans fat. The exception: conjugated linoleic acid is a trans fat that naturally occurs in some grass-fed beef, egg, and dairy products, and it’s not bad for you – in fact, it might actually be very good for you! If the food contains pastured/grass-fed animal products and the ingredients list doesn’t have anything “partially hydrogenated,” you’re probably fine. Net carbs aren’t listed on the label, but you can calculate them by taking total carbs – fiber. 100% added sugar, 100% junk! Make sure the net carbs fall within your own daily carb limit – for most people on keto, that’s 20 grams of net carbs per day. Remember that the label lists carbs per serving, which isn’t necessarily the entire package. The total sugar amount includes 7.4 grams of sugar that was naturally present in the strawberries and 8.4 grams of sugar from the table sugar. Breaking out added sugar lets you see how much of that comes from the table sugar. In general, added sugar should be as low as possible, ideally 0. A non-zero number in the total sugar line is fine if the food has fruit or dairy products in it. Protein: it’s totally fine if salad dressing or side dishes have barely any protein in it – but your meal as a whole should have at least 20 grams of protein. Ignore the calorie count per serving. 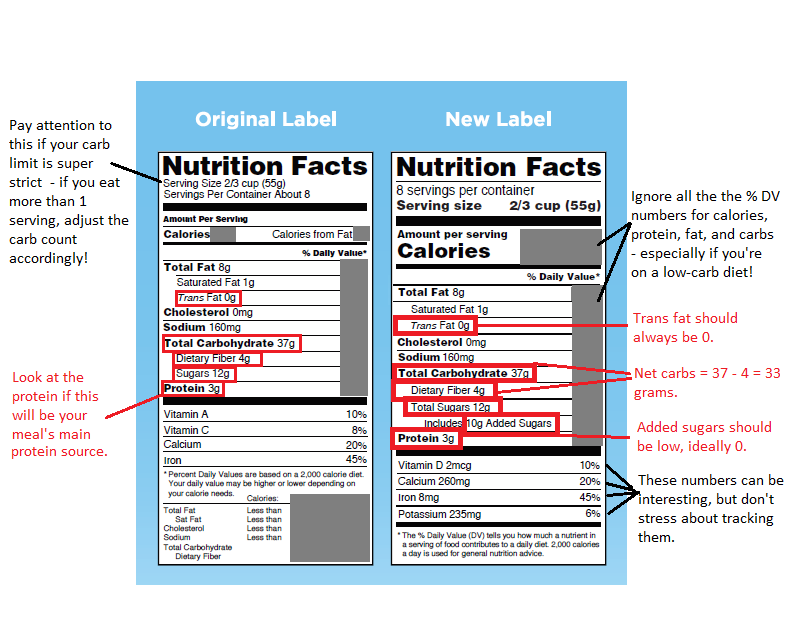 This is in big font on the new nutrition label because the USDA really wants you to pay attention to it. The official position is that everyone should be counting calories – but research actually shows that counting calories is a bad plan for losing weight and that a better strategy is a diet that automatically limits calories for you, without making you count them. So: don’t stress about the calorie numbers per serving. Ignore the % daily value numbers for protein, fat, and carbs. They’re all based on the assumption that you’re following the USDA recommended macronutrient ratios, which just don’t apply to most Paleo diets and are totally out of whack for anyone on keto. Ignore them completely. The percentages for vitamins and minerals can be interesting, just don’t stress about satisfying them exactly. That was a lot to take in, so here’s a quick, phone-friendly checklist: take a screenshot and keep it with your shopping list, or print it out and tape it to your paper list. Net carbs (total carbs – fiber) within your personal limit. The nutrition label can tell you (to a certain degree of accuracy) what is in the food. But labels can’t tell you how much you should eat or whether the food is right for you. That part is up to you. This post took a look at nutritional labels assuming that your goal is to eat either a Paleo or a keto diet (or both). If that’s not true, what are your target numbers? Figure that out first; then worry about reading labels.